This photo has been knocking around in my collection for a while now but always draws me back to it to enjoy it. Some of my best work has come when my mind has suddenly latched on to a composition. 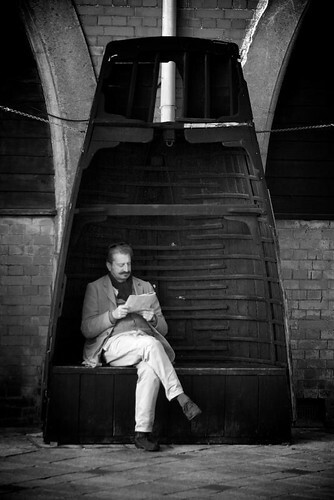 When i saw this man reading in a up-turned converted boat, the way he was sat, the symmetry of it all, I was so glad I had my camera that day! The subject matter and bold lines work so much better in black and white. Colour would never do this photo justice. As ever your thoughts and comments are welcome. You caught in a great pose, a “classic” pose.